Sun Earth Environment. Astrological Influence Proven. As science reveals more and more of the Wonders of the Solar System, it reveals ever more of its spiritual presence and complexity as well. And now it has proven the astrological effect of the Sun on us. On July 21st 2010, as the transiting Sun prepared to burst into its own sign of Leo, NASA announced stunning new information that confirmed the invisible unseen influence the Sun has on Earth’s behaviour and that of its inhabitants. During the time it takes you to read this article, something will happen high overhead that until recently many scientists didn't believe in. A magnetic portal will open, linking Earth to the sun 93 million miles away. Tons of high-energy particles may flow through the opening before it closes again, around the time you reach the end of the page. "It's called a flux transfer event or 'FTE,'" says space physicist David Sibeck of the Goddard Space Flight Center. 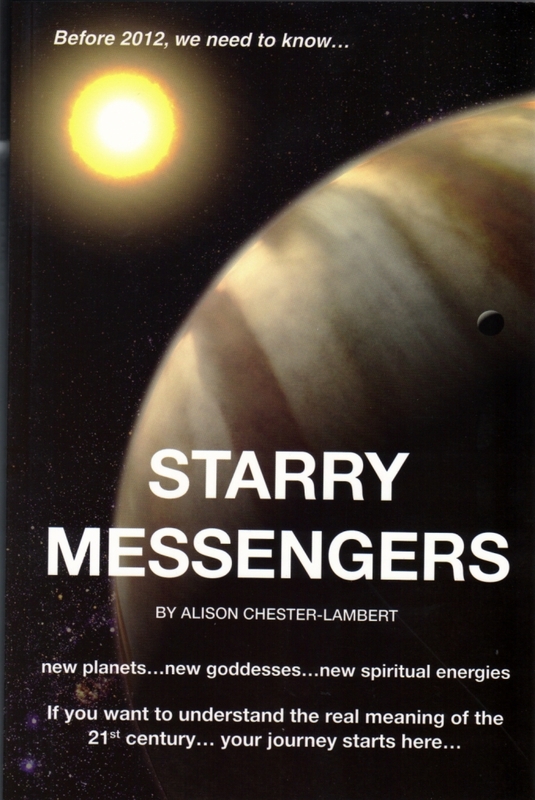 "Ten years ago I was pretty sure they didn't exist, but now the evidence is incontrovertible." Never has a scientific declaration come closer to admitting an unseen invisible influence which comes from the Sun and affects our behaviour. 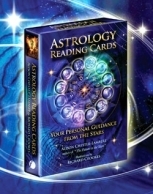 In short….. astrology. On April 21st 2010 they had held a press conference in Washington DC to unveil the first stunning images from the Solar Dynamics Observatory (SDO) which is a space telescope designed to study the Sun. They are stunning, but more than that they open the door to a whole new frontier of human understanding. For as science deepens its understanding of the King of the Solar System, the spiritual gnosis of the Collective will become more aware of the spiritual power of Fire and the Divine Will. Astrology, of course, has always known that this behavioural correlation exists between the Sun and its planets. The Sun is the heart, centre and life support system of a living, breathing Solar System, which is as dependant on it as any body is to its heart. The amount of power coming to Earth from the Sun is estimated at over 1kw per sq meter per second. This energy isn’t as obvious and straightforward as we might think, because it doesn’t come to us in the form of heat. Mostly it arrives as light, which is absorbed by the Earth (and sea) and then turned into heat which is released into our atmosphere. The energy that the Sun emits is described by the Electromagnetic Spectrum and it emits a broad range of energy at different frequencies from this spectrum. They range from high energy x-rays and ultraviolet radiation through to visible light and then infrared and radio waves. This magnetic and electric energy `radiates` out in waves, hence the term electromagnetic `radiation`. Out of this vast range, only a few specific energies reach the Earth’s surface, for our atmosphere protects us from a lot of it. Most of the solar radiation that reaches Earth is in the form of visible light, which is just a tiny section of the whole spectrum(2), but still energy and electromagnetic radiation. Light is funny stuff when you think about it, because we don’t really think about it being `electromagnetic radiation` which is a bit science-geeky. We just think about light as being…… well, light. The really strange thing is that the Sun is not solid and not all the same. It is actually a giant gas ball, made of hydrogen and helium; it does not have a definite surface and there are roughly three `layers`. It depends which band of the electromagnetic spectrum you are photographing it in, as to which layer you then capture. Inside, there is a core where nuclear reaction takes place and the resulting nuclear energy radiates outwards. Then there is a smooth-looking layer which could be seen as the surface, except it is liquidy. This is where visible light leaves the surface and this is what we see through solar telescopes on Earth. For some unknown reason it is much cooler than outer layers. Outside of that is the highly active, magnetically-charged, fiery-looking layer which we see using ultraviolet lenses; which our eyes couldn’t actually see even if we were able to look for it. Although our eyes have evolved to see only the light of one of those layers, a human being is equipped to receive so much more than light on the unconscious level. We know that our soul and spirit are spiritually fed by the Sun too, so it must give off so much more in a numinous `dark` energy from the other layers too. Another emission from the Sun is called Solar Wind which is best described as a stream of charged particles or bits of atoms that have nuclear energy. The different areas of the Sun produce wind of different speeds and densities. 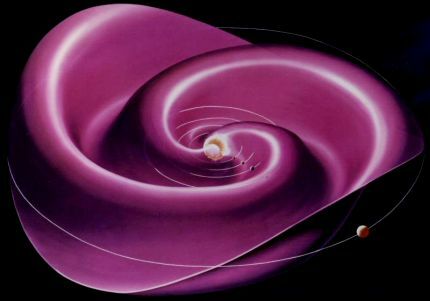 The slow solar wind has a speed of about 400 km per second and is more dense, but variable, turbulent and complex, just like the stuff in the outermost layer. The fast solar wind travels at about 750 km per second, and is just like the stuff that makes up the Sun's smooth-looking inner layer. (5) The presence of two distinct speeds of solar wind from two different layers of the Sun lends itself to a fascinating spiritual theory concerning Water and Fire which comes later in this article. For now, we can simply accept the fact that the Sun is a beautiful balance of Masculine and Feminine energy. For the core is very dense gas as gravity pulls it in, but the emissions from nuclear fusion radiates outwards so it doesn’t collapse in on itself. So…… the Feminine force of gravity pulls it in and Masculine force of radiation pushes it out. Last but not least of the Sun’s known effects on the Solar System is a magnetic field which is filled with solar wind, particle radiation, electromagnetic radiation and possibly much more stuff that we don’t know about. This protects the whole Solar System in a huge bubble called a Heliosphere. It is in a spiral since the Sun drags it around as it rotates in a full circle every 27 Earth days. Electrically charged particles tend to follow magnetic lines of force and so the two things form together to become transmission lines in space(6) making a rather beautiful image as you can see in the computer simulation. The Sun's magnetic field leads to many effects, one of which is that it changes the structure of Earth's outer atmosphere. Flows of electricity and plasma can pass like tidal waves or tides through the lines of any of the magnetic field lines surrounding the Sun or the planets, so the Sun’s magnetic influence affects all the stuff in the Solar System. Both the fast and slow solar wind can be interrupted by large, fast-moving bursts of plasma such as CMEs (coronal mass ejections) or solar flares (2 different things). A CME bursts out of Sun with billions of tons of matter, magnetised particles and other stuff and is flung at a speed of several million miles per hour across the Solar System. Then all sorts of stuff happens, including space storms, shockwaves, electromagnetic waves, tidal waves of force and accelerating showers of particle or ionizing radiation. To understand the affect of the Sun on the Earth, it is interesting to look at how it affects weather. The Sun’s rays strike the Earth head-on around the equator, delivering stronger energy and thus making it hotter. Elsewhere they hit the Earth at an angle and this spreads out the energy making it less hot. At the poles the angle at which the Sun’s rays hits the surface is quite acute, so there is very little heat generating potential. So we can understand from this when the Sun is more overhead in the Summer, it delivers more energy, spiritually as well as physically. Although the term `greenhouse gas` has become a negative one, the `greenhouse` effect is extremely important to the maintenance of the Earth's surface temperature. (10) It raises the average surface temperature above what would otherwise be too cold for life as we know it. Firstly, the hottest time for the Northern hemisphere is not the time when the Sun is most present. It is actually hottest in August when the daylight hours are less than the night time ones. How come? So anything, including our skin, will absorb light from the Sun and then emit that energy as heat. This heat is then trapped in the Earth and its atmosphere. (Called the `greenhouse effect`) But it takes 4 to 6 weeks for the heat to build up, so it is hotter a month or so after the longest days of the Summer. Interestingly, the water in our atmosphere and clouds is crucial to trapping the heat and preventing it from leaving the planet. Without it the Earth would have an overall temperature of -19°. With the very important water vapour holding it in, the Earth reaches an average +15°. (13) So, the Sun gives us energy, but it is thanks to waters protection that this is turned into a nourishing environment. It is here on Earth that the effect of Sun’s fire on the water in the Solar System is just right. Earth is in a unique position that means water can be manipulated by the Sun’s energy to form ice, steam, clouds or water. If we were any nearer to the Sun the heat would boil our atmospheric water. If we were any further away it would be too cold for life as we know it. Where we are is just right. From this perfection we can deduce that we are exactly the right spiritual distance from the Sun as well. There is something about how the balance of Water and Fire in our Soul and Spiritual existence finds just the right environment for our particular resonance. Our minds, bodies and souls are receiving nourishment and growing in complexity right where we are. For where there is physical balance of Fire and Water there is a spiritual balance too. A report in Newscientist in April 2010 raised very interesting facts about the special geographical position of Europe. It talks about “a compelling link between solar activity and winter temperatures in northern Europe. The research finds that low solar activity promotes the formation of giant kinks in the jet stream.” Researchers took the recorded temperatures from middle England going back to 1659 and compared them with the highs and lows in solar activity. They found that low solar activity coincided with colder than average winters and the statistics were very conclusive. This make complete sense of the Little Ice Age that occurred only in England in the 17th century. A further study in 2008 found that warmer than average temperatures were most likely in northern Europe when solar activity is high. It is no surprise that the Sun affects our weather, but why is Europe and England so special? Weathermen are guessing this is because of an interruption to the Jet Stream. We are normally protected by a fast moving current of air high in the atmosphere called the Jet Stream, which flows eastwards over our heads from the milder west. The guess is that during low solar activity this slackens and kinks, blocking the westerly winds and allowing frozen stuff from Siberia to make its way down to us. As the Earth moves around the Sun there are differences in how the Sun’s energy hits, or gets used by, the Earth, resulting in month by month differences to the energy we receive. This can be seen in an obvious way in the extreme differences of temperature and light that we experience from our different seasons. But the Sun represents spiritual energy as well and as such we can understand something more of the secrets of the incorporeal presence around us if we identify certain things we never knew before. 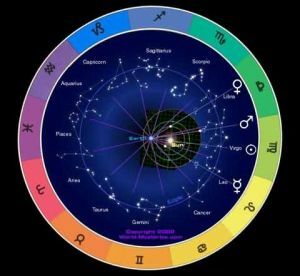 Science is revealing more and more of the Wonders of the Solar System and this gives us more information about the spiritual meaning of the Zodiac Signs of Tropical astrology. First we need to remember that the sky around us is portioned into 12 like the wedges of a Terry’s chocolate orange. 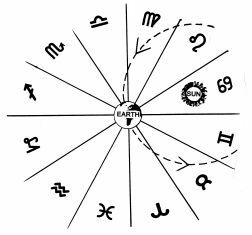 As the Earth moves around the Sun it takes with it the centre of the imaginary chocolate orange that is portioned into 12 different Zodiac signs as seen in the diagram. So although the Sun is the centre of the Solar System, when it comes to the apportionment of the sky into Zodiac signs, if we are using a geocentric (Earth centred) system, the Earth is at the centre. From our position on Earth, it then looks as if the Sun is passing through that sign, even though it is really the Earth that is moving. Both images to the left show how the Earth moves around the Sun dragging the centre of the imaginary Zodiac belt with it. For starters, March is the most geomagnetically active month, particularly on the 21st which is the equinox and in Aries we have a highly charged Fire sign, known for its impatience and eagerness to begin the journey. There is an enthusiastic innocence to explore, drive forward and champion the way. Although Aries is happy to battle and has a sense of assertive strength, Aries-type people can be naively and innocently helpful to others. The equal-ness of the Sun’s light during his time in this Sign demonstrates the Aries need to champion the cause of the down-trodden or hard-done-to. October is the second most geomagnetically active month and now the Sun is in Libra, having just passed the Autumn equinox. Don’t let anyone persuade you that this sign is all hearts and flowers, because it is much more likely to adopt “an eye for an eye and a tooth for a tooth” attitude in an effort to balance those scales. Libra expends vast amounts of energy striving to get things just right and the Libran-type person can certainly be forceful, as we saw in Margaret Thatcher. The Sun is in the signs of Cancer and Capricorn when it is at its highest and lowest points in the sky; the time of the solstices. Our understanding of Cancer as it is experienced in the Northern hemisphere becomes even more mysteriously complex when we examine the various synchronicities with the Sun’s maximum availability. It is at first difficult to see the connection between the period when we receive the most daily sunlight and the watery sign of Cancer, but after some burrowing (ha….crab…) it becomes more obvious. Firstly, there has to be a connection between light and the Water element. Just GOT to be. This is reinforced by the seasonal appearance of noctilucent clouds which form very high above the Earths atmosphere after the Sun has gone down around the Summer solstice in late June. These luminescent pearly blue clouds occur 50 miles above the Earth whereas normal clouds are only about 2 miles up. Since these are made up of ice particles, water has become present in a place which is supposed to many hundreds of times drier than a desert. When the Sun appears to be in Cancer, we are flooded with energy (warm and watery) that we absorb and turn into warmth that gets hotter long after the sunlight has gone. Do we re-charge our batteries and collect memories that warm us in winter? Cancer is a sign that `holds on`, it is secretive, moves slowly and does not act in an obvious way, much like the slow, un-seen gathering of the heat by the Earth. It is interesting to suggest that watery-ness in the Sun’s light clings to Mother Earth in an emotional and unconditional embrace. Ok, now I’m getting slushy…….. Whilst we’re there, think of how Cancer’s Water then feeds into the Fire of the hot and steamy sign of Leo, the Sign after it in the Zodiac belt. The difference between how Cancer and Capricorn are experienced in the different hemispheres of our planet shouldn’t be too difficult to explain, but would require a whole new article to do it justice. 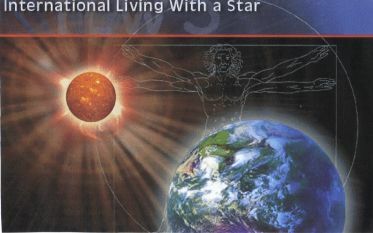 Briefly, we have already seen how Europe receives different electromagnetic radiation effects to the rest of the planet and I have no doubt that the `feeling` and experience of Cancer and Capricorn is subtly changed in some way in the Southern hemisphere. South Americans, Australians, South Africans and Europeans do have cultural differences and that can’t be argued with. There is actually evidence of a seasonal change in sub-atomic or quantum environment as the Sun appears to move through the Zodiac signs that has a solstice, June/December coincidence. Deep in the heart of an Italian mountain, scientists working at a giant neutrino detector deep underground are puzzling why it is that they catch more in June and less in December than in other months. One guess is that this is because the Earths speed around the Sun is faster in June. It is thought that this increase in speed is because the Earth is moving in the direction of the Solar System as it moves around the centre of the galaxy then. In December it is going against the general flow, as it were. (14) It is hard not to think of the hard work of Capricorn as it toils uphill and the Earth’s battle to orbit the Sun against the main current of the Solar System moving around the galaxy centre. Radioactive Decay is Seasonal – Weird but True. This is a weird one, and there is no explanation. Radioactive decay is greatest around February (Sun in Aquarius) and weakest in August (Sun in Leo). Up until now, the decay rate of atoms in a chunk of radioactive material was un-challengeable. The rate was supposedly constant under all conditions. Quite simply, on a quantum level an atom decays, then there are fewer left and decay happens less frequently as fewer remain. The decay rate should decrease steadily over time and is predictable. It turns out, however, that although it is predictable over years, the decay rate wobbles seasonally. Some scientists say this variation tracks the variation in the distance of the Earth to the Sun, which has a slightly egg-shaped orbit. They claim the Sun’s neutrinos speeds up nuclear decay rates and they are more concentrated nearer to the Sun because they spread out as they speed away. BUT the Earth is closest to the Sun in late December/early January (3rd Jan is the peak) and furthest away in late June/early July (4th July is the peak), so the February/August radioactive decay timetable is not the same. So we have three separate energies coming from the Sun. The first is electromagnetic, (electricity and magnetism) as in charged particles and magnetic field lines, which are rebuffed from the main body of Earth, but enter in at the Poles. The second is light, which is also electromagnetic radiation but enters the Earth in a reverse way. For light has greatest effect at the Equator and is weakest at the poles. And the third is gravity. Everything that has mass has gravity, so you and I exert a gravitational tug too and the more mass a thing has, the more gravity it exudes. The Sun is 99.8% of the known mass of the Solar System and its gravity actually defines the limits of the Solar System. Putting this into a spiritual paradigm, we can see how the Sun delivers spiritual sustenance in different ways or handles and distributes different elements in different ways. We saw earlier how the Sun has different layers or regions that work in different wavelengths of the electromagnetic spectrum. Within the Sun itself, it is easy to identify the two fundamental energies of Masculine and Feminine. The solar wind (plasma, charges particles and magnetic field lines) radiate OUTWARDS and the similarity with Masculine or Yang energy is obvious. The Sun’s gravity, however, pulls everything into the centre, stabilising and holding on, which is the natural inclination of Feminine or Yin energy. The Sun has long been associated with healing qualities, as has Water. Is it possible that the as yet unexplained coolness of the layer called the photosphere, with its emissions of a different type of solar wind are flagging up the likelihood that the Sun feeds us directly or indirectly with the Water element too? The Sun is therefore a visible source, distributor, producer or manipulator of numinous Water. The Piscean (Water sign) love of white and the association of the great white light with the pure spiritual aspirations of Water have just got to be associated with visible white light of the Sun which then transforms into heat as it hits the Earth. Since Fire and Water are the two elements that make up dark matter and energy, this makes so much sense. The way the Sun lifts the water on the Earth providing us with life itself, demonstrates a symbiotic relationship with each other that was recognised by Omraam Mikhael Aivanhov in his book “The Mysteries of Fire and Water” in 1991. In this interesting statement, we can really see the connection between the Sun in Cancer and the sunlight of Summer. I shall leave you with that lovely thought. 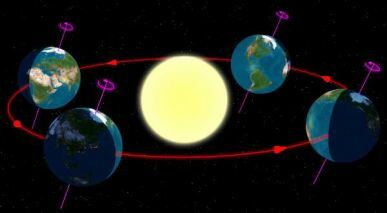 An explanation of how Earth’s orbit around the Sun produces the seasons. Starting at the beginning of the cycle around March 21st the Sun is square on to the Earth’s equator and the `side` of this tilt. So it is exactly overhead in the sky at midday, shining an equal amount of light onto the Northern and Southern hemisphere. At this point the Sun is in the Sign of Aries. But as the Earth moves around the Sun over the next 3 months the Sun appears to be directly overhead at a higher latitude each day until around the 21st June, when it appears to be overhead to those living on the Tropic of Cancer. (The line that runs around the Earth above the Equator) That is when the Northern hemisphere is pointing towards the Sun and it is high summer in England. The Sun achieves it highest arc in the sky around the 21st June and it is called the Summer Solstice. This date is when the Sun moves into the Sign of Cancer. The Earth continues to orbit the Sun and as it moves around month by month it eventually presents the other `side` of its tilt, so that the Sun appears to be overhead the Equator at midday around the 22nd September. This is when the Sun moves into the Sign of Libra which, appropriately enough, seeks balance, evenness and equanimity. Three months on and the top end of the Earth’s axis is now pointing away from the Sun at midday on the winter solstice around 21st December. Because the bottom part of the Earth is mainly facing the Sun each day they are having their summer. Here is England we only see the Sun make a low sweep along the horizon for a few hours each day. This is when the Sun moves into Capricorn and the attributes of this Sign can be fully understood in the harsh, rugged and austere barrenness of the land, when resilience and fortitude would have been required in times before gas and electricity. From this point the Sun appears to move higher in the sky each day, giving us more daylight minutes, until we reach the beginning of the cycle with the Sun overhead the Equator at noon on the Spring equinox around 21st March. This marks the Sun’s move into Aries, a sign known for its leadership and eagerness to move forward. These 4 turning points in the Earth’s path around the Sun mark out the Cardinal cross. The extremities, or extreme polar differences between our possible achievements or attainments. Each point of the cross represents an Element and also a strongly defined archetypal milestone in the life of a human. Briefly, they are to individuate or be self-centred (Aries); to belong to or have a family (Cancer); to engage with another in relationship (Libra); and finally to establish and achieve in career (Capricorn). It is very difficult to excel at any of these and not fail in the others. For instance, if one gives birth to a family, or is a carer for an elderly family member, then it is almost impossible to achieve in a high flying career. Or if one really focuses on the teamwork of relationship, then one looses some of ones own autonomy.